Sihanoukville, Cambodia has beautiful beaches and lots of seafood. I still remember vividly about my last summer vacation I had in my country, Cambodia. I went to Sihanoukville. It is located on the west coast of the country. I stayed at my aunt’s house, the only place I could lodge while I was there. Her son used to live with my family at Phnom Penh when he was getting his education. 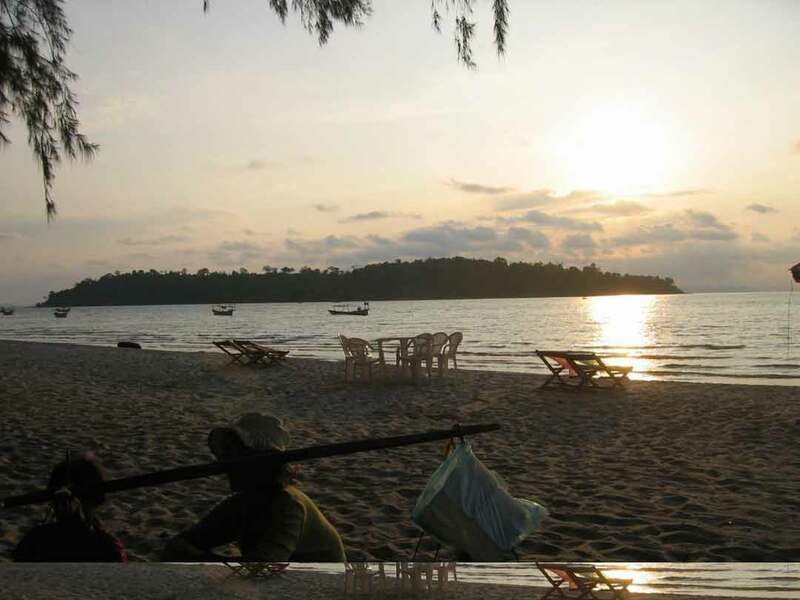 The fascinating thing about Sihanoukville is its beautiful beaches. This city has very good weather conditions. It is neither too hot nor cold, which gives a great benefit for everybody who lives or visits there. It took me about three hours riding from where I live to get to Sihanoukville. Actually it is not that far in distance, but the road was too small and a little dangerous for vehicles to drive at a fast speed. I went there by the public bus, which cost me $2.50 to ride one way. You can see a lot of interesting things along the way to Sihanoukville from my city, Phnom Penh. The view changes differently from one region to another. Sometimes you can see an entire rice field on both sides of the road and the mountains far in the distance, which look very blurry and almost blank like a massive dark green shadow. In some places what I will see is small cottages and farms full of different kinds of trees, standing in rows like soldiers. When you get close to Sihanoukville, mostly what you can see is quiet mountain ridges. It makes you feel peaceful in a place which is full of trees all around. After you drive past all the mountains, you start to see houses, which made me know that I was almost where I needed to go. When I got out at the bus stop, my aunt was there waiting to pick us up to go to her house. Then when we got at her house, I took a nap because of our long trip. After I got up from napping, immediately, I went to call some of my friends in that city to go fishing with them. The place where we went fishing was about four or five miles away. We spent about 45 minutes walking on the sandy path and I was very exhausted. But my exhaustion was changed when I arrived at the seaside to do fishing. I didn’t feel tired anymore, but joy and fun was coming to my mind. The air was fresh; the sea looked beautiful and so huge that I couldn’t see the other side. The sky seemed to touch the see. Sea birds flew around and around to catch the fish as their food. We were there for about two or three hours and then we headed back home on the same path. During the time I spent there, almost everything I ate was seafood and it tasted pretty delicious. It makes me hungry every time I think about that type of food. Plus my aunt is also very good at cooking all that tasty food.